We believe the preschool years are the foundation for academic success, for forming a healthy personality, and for developing self-confidence. TCPS is committed to providing a Christian atmosphere in which children are accepted and loved for who they are. It is our commitment to use God’s Word to teach and develop each child to their fullest potential – spiritually, mentally, physically, and socially. During the school day, teachers create a balance between individual work, whole group activities, and small group lessons. Our program is designed to foster an environment where children can grow and thrive as they begin their educational journey. We offer a variety of programs for children ages 3 to 5 years old. Full time is Monday-Friday, or you may choose part time options of Monday, Wednesday, Friday (M/W/F) or Tuesday and Thursday (T/Th). The T/Th option is only available to our 3-year-old students. Preschool hours for full-time and part-time students are 7:30am to 3:00pm with drop-off and pick-up anytime within our operating hours. Aftercare is provided after 3:00pm until 5:30pm for $5 per day. The full-day session includes the core curricular program, a morning snack with juice, a rest time, an afternoon snack with juice, and additional learning center time. Our center is licensed by the Tennessee Department of Education (DOE). We align our teachers, programs, and curriculum with all regulations as mandated by the DOE. 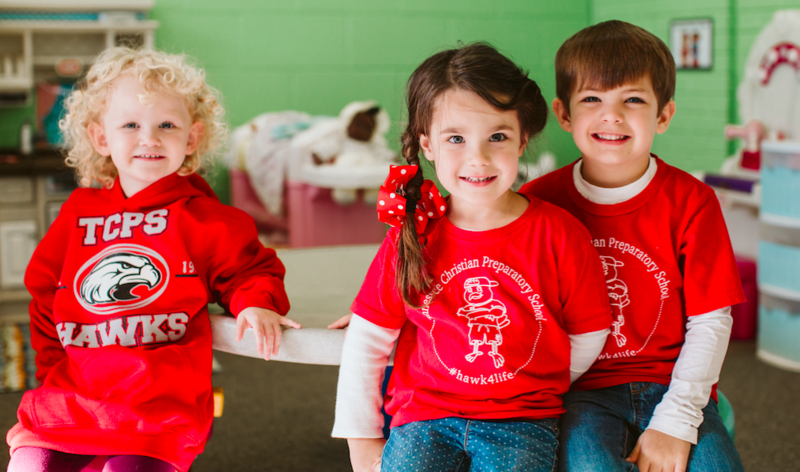 The 3-year-old program at Tennessee Christian Preparatory School provides opportunities for children to build social skills and the confidence to function independently in and beyond the classroom. Academic emphasis is placed on recognition of shapes, colors, the alphabet, phonological awareness, and formation of each letter of the alphabet as well as a calendar study of days of the week, months of the year, and weather patterns. Children begin simple math lessons with the recognition of numbers 1 through 20. Language development is part of every phase of the curriculum. The creative use of vocabulary is encouraged through circle and story time, discussion of home and school experiences, poetry, and song. Arts and crafts are an exciting part of the preschool day. Children are given the opportunity to explore a wide range of art media including, finger paints, watercolors, clay, and collage. A time of prayer and biblical instruction is included in each day’s schedule. 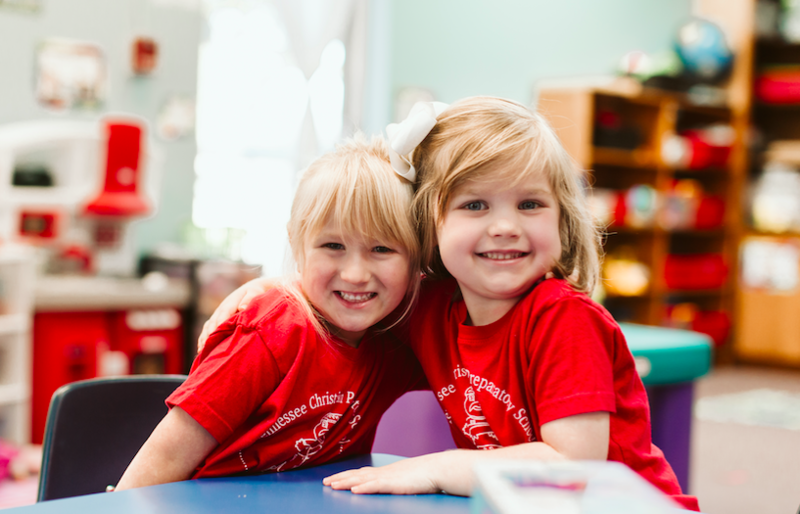 The 4-year-old program at Tennessee Christian Preparatory School is a place of dynamic learning where lifetime habits are formed. Children are encouraged to become self-directed, independent, and comfortable in a learning environment through practice and repetition. During this year, children explore beginning reading and writing skills, recognition of numbers 1 to 20, counting to 100, sorting, sequencing, and classifying. Language development is part of every phase of the curriculum. The creative use of vocabulary is encouraged through circle and story time, discussion of home and school experiences, poetry, and song. Arts and crafts are an exciting part of the preschool day. Children are given the opportunity to explore a wide range of art media including, finger paints, watercolors, clay, and collage. K4 students attend special enrichment classes of Spanish, Music and Library weekly. A time of prayer and biblical instruction is included in each day’s schedule. Trike-A-Thon – Each spring our preschoolers participate in our annual trike-a-thon. The Trike ride is a fundraiser that allows us to purchase new equipment for our center. The students bring their favorite riding toy to school and enjoy racing around the course with their friends. Handbell Choir – Our handbell choir consists of our 4-year-olds under the direction of their music teacher. This choir will perform at the annual Lower School Christmas Program. Grandparent’s Day – A favorite around our campus. On this day our preschoolers will open the Grandparent’s Day program with a very sweet surprise performance. After the program, the little ones enjoy shopping at the school book fair, having a light breakfast, and getting their pictures taken with their grandparent’s. Leap Day – K4 students get a firsthand look at life in Kindergarten. Students will begin the day in chapel, experience Kindergarten classes, and end the day at lunch with their Kindergarten friends. Fine Arts Festival and Spring Concert – This event is our preschoolers time to shine! Our preschool students take center stage and sing for a packed house of friends and family. After the performance families gather in the courtyard to view the students displayed artwork. Take the next step in your child’s education journey! Schedule a visit to our campus and learn more about the TCPS preschool programs, or feel free to ask any other questions you may have.